My first venture into the world of Miss Masters with The Dragons of Heaven was an interesting one as her story is sort of a superhero piece but also one that touches on Chinese mythology in a grand way. This doens't necessarily make her like the shadow-manipulating equivalent of Thor but it is sort of related in a general sense. She is more than just a run of the mill superhero and is somewhat burdened with a lot of responsibilities and obligations to figures who could probably termed as deities. The Conclave of Shadow continues these adventures and allow us to further explore the other realms beyond our own. The first book introduced us to the shadow realms as something Missy could reach but not a place she ventured to happily. This book brings us back into shadow in a more significant way as that's where the trouble is brewing. The book feels a little long, but maybe that's just me. It takes a while for the piece to really build up steam given all of Missy's personal drama from the end of the first book. But the final resolution to things was pretty compelling. 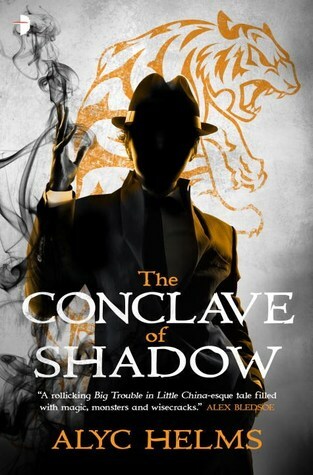 Synopsis: The Conclave of Shadow is the second book in the Missy Masters series as written by Alyc Helms. Disclosure: I received a free advanced copy of this book as part of the Angry Robot Army review program via NetGalley in exchange for my honest opinion of the work. Missy Masters continues to fight crime as Mister Mystic, the superhero her grandfather once was, in the streets of San Francisco. Despite helping save the world she hasn't been all that into appearing in the public eye especially given how those events resulted with being reunited with her children then estranged from them and her being pledged to be the champion of an enemy. But when magical forces steal special technology from a museum exhibit, the Argent Aces turn to Mister Mystic for help in understanding what is going on. And she can't exactly ignore this sort of affront, especially when the sigils used to execute the heist seem to originate from the Shadow Realms. All is not well in the Shadow Realms as the shift in power from the last book has resulted in the Voidlands growing out of control and beginning to encroach on more Shadow territory. This expansion has real world consequences experienced as increased seismic activity. Missy will need to find new allies in this battle but how does one find friends among the denizens of the Shadow Realms? What I Liked: The internal mythology of these books continues to be quite fascinating as you have the Chinese aspects that dominated the first book now joined by the other forces of Shadow. There's a lot more story there as the Shadow Realms have their own set of rules and how our heroes deal with all that makes for some interesting reading. We also got to learn of another realm, this being where djinns come from. And this just opens the door for other mythologies and beliefs becoming part of the larger narrative in time. The book also had a lot of great action moments whether it's people in the real world trying to fend of an attack taking place in Shadow or the big chase across San Francisco as Missy Masters and her allies tries to execute their big plan to stop the advancing of the Voidlands. It was a great way to tie a lot of different things together and still have an ending that was a little unexpected but still satisfying. What Could Have Been Better: Given how the last book ended, I sort of wished we would further explore her new role that has brought her into conflict with her children and the divine love of her life. And while we do get to see the aftereffects of that choice in terms of now icy relationship with both of her children, we don't get too much else. We have one effort to petitionf or help and an odd cameo towards the end and that was it. There's a lot more to unpack there but this is not the book that will address those questions. The book ends with a lot of things riding on Missy's shoulders and as much as other people try to help out, they can only offer very limited assistance that sort of feels like when all Cloud's friends help him jump higher at the end of Final Fantasy VII: Advent Children. Thus it's a lot of cameos and maybe a touch of action but not much else given Missy has to run off to the next stop on her quest. And given the increasing diversity of the folks around Missy, it's only natural to want to see more of them. TL;DR: The Conclave of Shadow is an interesting follow-up to the first one that provides more questions for readers to ponder but not as many answers. It still has some pacing concerns but once the action kicks into gear then it really goes pretty well. Thus the book gets good 3.5 creatures of Shadow that Jane encounters in her travels out of a possible 5.